Today, March 30th, is Mom’s birthday. She was born in 1959 and would have turned 59 this year. 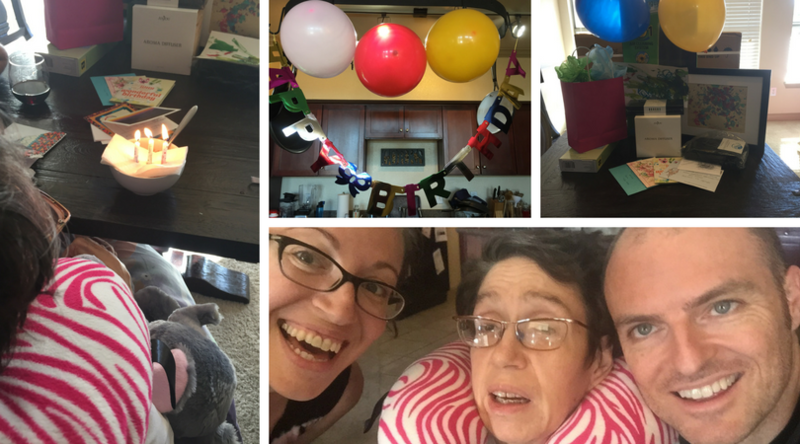 We are missing her a lot, but I thought a fun post might be sharing ways to celebrate birthdays with loved ones you care for, especially if they have special needs. Open presents and take pictures! It worked out great because we didn’t end up with extra socks and lotion like we did most years – instead, Mom got some nicer items that she benefitted from pretty much on a daily basis and we could remind her of things like, “Oh, remember Dad got you this great air purifier that’s gonna help with your allergies!” or “Look at your grandbaby’s sweet drawing on the wall!” and so forth. 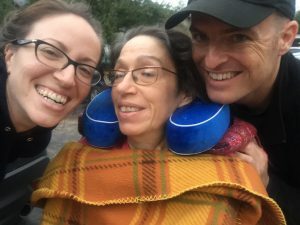 It became a more frequent reminder of all the people in Mom’s life helping her out and thinking about her. Birthdays are always such special days when it comes to loved ones for whom we care. If you’re planning some birthday fun for your loved one, keep in mind it’s not necessarily what you do or how extravagant your celebration is, as long as your loved one is comfortable and having fun, anything goes! Going out for dinner might not be in the cards, but relaxing and watching a favorite movie and eating cake could be just as joyful. Previous Previous post: 1 . . . 2 . . . Omega-3’s!